#These two authors contributed equally. Enterovirus-71 (EV-71) infects fetuses. From May to October 1998, eight cases of prenatal EV-71 infection were identified. In this study, we report the pathological features of 8 transplacentally infected cases and their post-neonatal sequelae. EV-71 was detected in amniotic cord blood by nested reverse transcription-polymerase chain reaction. Tissue location of virus infection was determined by immunohistochemistry of a stillborn. The fetus infected early in the gestation was stillborn. The other fetuses were carried to term. During delivery, two newborns had biliary atresia, and one developed acute hepatic failure. One child was diagnosed with cerebellar hypoplasia at age 3, two were diagnosed with autism at age 7, and one was diagnosed with Asperger’s syndrome at age 12. Our results suggested that some of pediatric autistic disorders might be non-genetic, but virus-associated. Interestingly, most of the patients were associated with constipation, andhaving food debris in their feces, which were consistent with prenatal findings that EV-71 infected liver, and infection could be persisted into childhood. Enterovirus 71 (EV-71) is a member of the Picornaviridae family of single-stranded positivesense RNA viruses, which comprises 69 types , including polioviruses and EV-71, which frequently have severe neurogenic consequences [2-4]. Magnetic resonance imaging (MRI)  and postmortem examinations show that lesions are predominantly in the brain stem, cerebellum and spinal cord [2-8]. Since poliovirus infection has been eradicated by a successful vaccination program, EV-71 is thought to be responsible for young children having aseptic meningitis, encephalitis, myelitis and paralysis, symptoms of infection in central nervous system (CNS), in particular in 1998 outbreak in Taiwan . Besides neurologic symptoms, most patients were hyperglycemic and had increased serum levels of aspartate aminotransferase, alanine aminotransferase, and lactate dehydrogenase (AST/ALT/LDH) (supplementary Table 1), indicating that the virus infected liver as well. During the 1998 EV-71 outbreak, incidences of pediatric biliary atresia also increased markedly although the number of patients was not reaching an alarming level. In a case of stillborn, EV-71 was detected in samples of amniocentesis . Using an immunohistochemical staining, the virus was detected in fetal midbrain and liver, indicating that EV-71 infected the fetus . In this report, we present eight cases of prenatal abnormalities, which have been collected throughout the 1998 EV-71 outbreak in Taiwan, and the continuous follow-up of these cases for the past 20 years. Three cases developed autism spectrum disorders (ASD). The presence of EV-71 was measured in all expecting patient’s plasma and fetal cord blood using a reverse transcription-polymerase chain reaction (RT-PCR) [5,9]. The first pair of primers were 5’-ACCTTTGTACGCCTGTT-3’ and 5’-ATTGTCACCATAAGCAGCCA-3’, and the second pair of primers were 5’-AAGCACTTCTGTTTCCC-3’ and 5’-ATTCAGGGGCCGGAGGA-3’. The amplified product of 249 base-pair was resolved on a 2.5% agarose-ethidium bromide gel. Specificity of the amplified product of EV71 was confirmed by DNA sequencing (ABI Prism; Perkin-Elmer, Foster City, CA). Complications of case #5 were noticed when the child was around 12 months of age (identified at Changhua Christian Hospital, Changhua City), with major symptoms of general hypotonia. However, no abnormal eye movements or telangiectasia was found. Neither was a defect in the synthesis of organic acids or arachidonic acid detected. The patient had a 46,X,inv(Y) genotype (p11.2q11.2); and no other chromosomal aberration was found. Electroencephalograms measured a focal spike over bilateral frontal areas; the patient, nevertheless, did not experience epileptic seizures. Patient #5 was diagnosed as having delayed neural development as well as mental retardation, and received more than a year of rehabilitation therapy. No noticeable improvement was observed. Statistical curves were plotted with a method of CURVEFIT. The difference between observed frequency and expected frequency of autistic patients was obtained by subtracting the expected value from the observed value. Statistical analysis was performed using SPSS statistical software (version 12.0, Chicago, Ill). From May to June 1998, eight cases of prenatal complications (Table 1) were identified in China Medical University Hospital, Taichung, Taiwan. All pregnant patients had complaints of severe abdominal cramping and three had suspicions of fetal abnormalities. Although the patients were at different gestational periods, they all showed varying degrees of enlarged placenta and fetal hepatomegaly, as determined by obstetric ultrasonography. Amniocentesis was performed using an ultrasonographic guidance. Moreover, because of the outbreak of pediatric EV-71 infection, and detection of EV-71-related fetal ascites in one of the early cases , the presence of EV-71 was measured in all patients’ plasma and fetal cord blood. Analgesics had been prescribed for the expectant mother of case #1. For cases #5 to #8, tocolytic drugs were administered to stabilize the fetuses and to prevent miscarriages. No specific care was provided for the fetuses. Table 1: The eight cases of EV-71-related prenatal complication and their follow-up results. 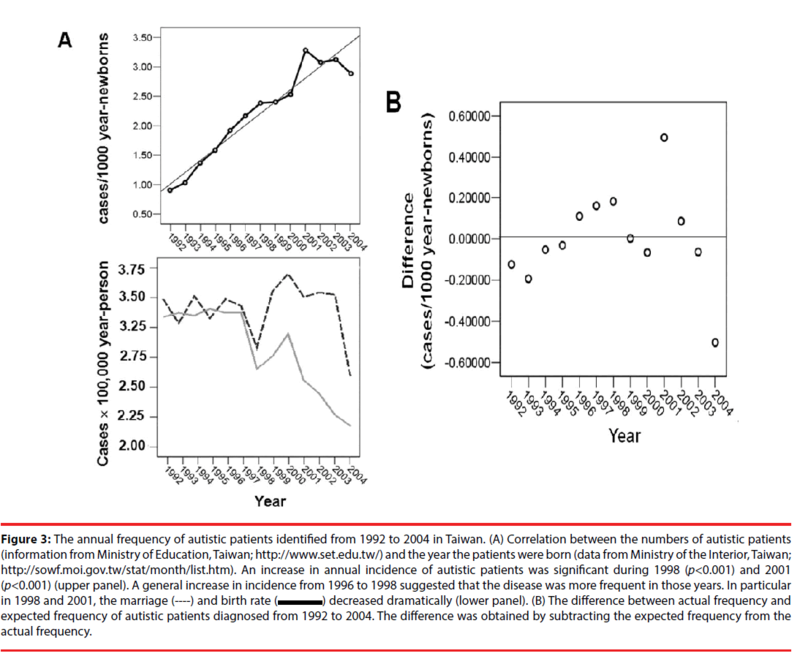 In fact, during enterovirus 71 (EV-71) outbreaks (1998), incidence of two diseases: prenatal abnormality and pediatric biliary atresia increased markedly in Taiwan . At that time, several expecting women were admitted to the hospital because of abdominal cramp. Following admission, echosonography showed that some patients’ placentae were bulky with evident, thick margins. It also demonstrated that in severe cases, the fetuses had evident hydrocephalus, hepatomegaly with ascites, and pleural effusion (Figures 1A-1D). In case #1 (Table 1), the postmortem examination showed that the stillborn had an enlarged liver with fibrotic peritonealitis, along with obvious hydrocephalus in the lateral ventricle . EV-71 was detected in neurons and glial cells of the midbrain and cerebellum, as well as in hepatocytes using an immunohistochemical staining . Monoclonal antibodies that were specific to EV-71 were used to identify the presence of EV-71 (3324, Chemicon, Temecula, CA) . EV-71 was not detected in hematopoietic cells in fetal liver. In addition to EV-71-positive parenchymal cells of the liver, the strongest signal of EV-71 infection was located in a strip of cells, which resembled lining cells of primordial hepatic ducts (Figures 1E and 1F). Figure 1: Echosonography and liver pathology of prenatal EV-71 infection. Echosonograms showed that a 25-week fetus had (A) mild hydrocephalus of both lateral ventricles, (B) enlarged liver with evident calcification, (C) excessive ascites, and (D) pleural effusion. Although abnormal serum levels of pregnancy associated plasma protein A and beta human chorionic gonadotrophin was noted, no karyotypic trisomy 21 was detected in chorionic villus samples. EV-71 was detected in cord blood by RT-PCR. (E) Detection of EV-71 in frozen sections of fetal liver tissue by immunohistochemistry. EV-71 was detected in normal (arrowheads) and necrotic hepatocytes (arrow), but not in fetal hematopoietic cells (white arrow). (F) In addition to EV-71- positive liver parenchymal cells (arrowheads), strong signals of EV-71 were located in lining cells of primordial hepatic ducts (arrows), which contained condensed bile. In newborns with biliary atresia, EV-71 was also detected in necrotic parenchymal cell (white arrow). EV-71, however, was not detected in the portal system or arterioles (lower right corner). Case #1 was miscarried within 3 days of admission. Although cases #2 to #4 were safely delivered, the three newborns were jaundiced. They were diagnosed as having biliary atresia and were immediately scheduled for surgery; however, case #4 died of acute fulminant hepatic failure after appropriate procedures . EV-71 was also detected in both hepatic parenchymal cells and epithelial cells of hepatic ducts in newborns with jaundice (cases #2-#4, biliary atresia and acute hepatic failure). The presence of EV-71 was confirmed by nested RT-PCR, along with 29 (85.3%) resected specimens of the 34 cases of infant biliary atresia . Jaundice in case #4 was found on the second day of birth and the infant died of acute severe hepatic failure despite proper attendant surgery. Unlike the other six surviving infants and their mothers, who had measurable serum antibodies to EV-71, case #4 did not have detectable antibodies to the virus. Its mother did not have detectable antibodies to EV-71, until two weeks after delivery. As mentioned above, case #5 was diagnosed as having mental retardation due to delayed neural development. 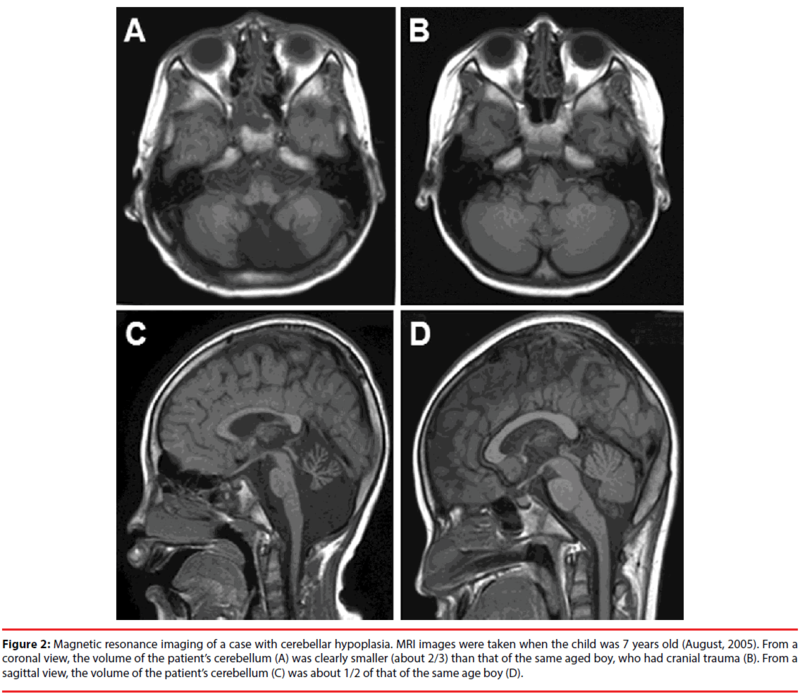 Magnetic resonance imaging of the brain, however, showed a clear cerebellar hypoplasia (Figures 2A and 2C), when compared to a child with head trauma (Figures 2B and 2D). Moderately increased intensity in the dentate nuclei and supratentorial periventricular white matter suggested that the patient might have had prior brain lesions, which might not have been caused by external traumaassociated damage, but instead by a prenatal injury, including virus infection. Figure 2: Magnetic resonance imaging of a case with cerebellar hypoplasia. MRI images were taken when the child was 7 years old (August, 2005). From a coronal view, the volume of the patient’s cerebellum (A) was clearly smaller (about 2/3) than that of the same aged boy, who had cranial trauma (B). From a sagittal view, the volume of the patient’s cerebellum (C) was about 1/2 of that of the same age boy (D). In cases #6 - 8, although the peculiar early childhood behaviors had been noticed, they were not specifically attended. However, when they reached the age of primary school years, their unusual behavior alerted teachers with specific educational focuses [11,12]. Moreover, because the parents were unwilling to admit their child’s irregular behavior, case #8 was not confirmed until he entered the middle-high schools. The pediatric patients with autism (cases #6 & #7) or Asperger’s syndrome (case #8) were diagnosed and confirmed according to criteria defined in the Diagnostic and Statistical Manual of Mental Disorders (DSM IV). Cases #2 and #3 were not autistic. The Medical Ethical Committee of China Medical University Hospital approved the study (DMR101-IRB2-50), and written informed consent was obtained from every guardian of the patients. Findings of cases #6 - #8 led us to search for the available public information records and statistically analyze the frequency of autism from 1992 to 2004, including two major episodes of EV-71 infection during years of 1998 and 2001 in Taiwan . A correlation between numbers of autistic patients (public information from Ministry of Education, Taiwan, http://www.set.edu.tw/) and years of patients born (public data from Ministry of the Interior, Taiwan; Monthly Bulletin of Interior Statistics, http://sowf.moi.gov.tw/stat/month/ ) was found. As shown in Figures 3A & 3B, the number of diagnosed autistic patients (Figure 3A, upper panel), who were born in the years 1998 (p<0.01) and 2001 (p<0.001), increased markedly, despite the fact that marriage and birth rates decreased dramatically during those particular years (Figures 3B, lower panel). The difference between observed frequency and the expected frequencies of autistic patients during the years of 1998 and 2001 were highly significant. There were respectively 2.4-fold and 3.5-fold increases. Figure 3: The annual frequency of autistic patients identified from 1992 to 2004 in Taiwan. (A) Correlation between the numbers of autistic patients (information from Ministry of Education, Taiwan; http://www.set.edu.tw/) and the year the patients were born (data from Ministry of the Interior, Taiwan; http://sowf.moi.gov.tw/stat/month/list.htm). An increase in annual incidence of autistic patients was significant during 1998 (p<0.001) and 2001 (p<0.001) (upper panel). A general increase in incidence from 1996 to 1998 suggested that the disease was more frequent in those years. In particular in 1998 and 2001, the marriage (----) and birth rate ( ) decreased dramatically (lower panel). (B) The difference between actual frequency and expected frequency of autistic patients diagnosed from 1992 to 2004. The difference was obtained by subtracting the expected frequency from the actual frequency. The current results supported our previous observations that EV-71 could be transmitted through placenta to infect fetus . Schmidt et al. had isolated enteroviruses from a newborn, and corresponded with our findings . In this study, our results showed that during the early second trimester, the virus could damage fetus’s primordial organs, and induced stillborn. In intermediate second trimester, EV-71 particularly hindered the growth of cerebellum [5,9]. In the late second trimester, because of the maturation of most fetal organs, EV-71 did not immediately kill the fetus, but caused unfavorable sequels of future neurological disorders. The afflicted CNS regions corresponded well with MRI findings in children with EV-71 infectionrelated encephalomyelitis in the brains and spinal cords , the fundamental locations that associated with disadvantaged limb movements and interaction behaviors . Significant differences in statistical analyses of annual autistic population changes within those two specific years in Taiwan strengthened the correlation between prenatal EV-71 infection and an increased likelihood of autism. From an epidemiologic assessment of fetal and infant factors associated with autism, Mason-Brothers et al., found that a viral-type illness during pregnancy could increase the frequency of autism . However, they did not determine the type of viruses. In this study, we detected prenatal EV-71 infection in all eight expecting women, of whom symptoms could have been overlooked. Although our results strongly suggest that prenatal EV-71 infection and disease manifestation of autism could be closely associated, the causal relationship between the two diseases awaits further study. Using the Denver Development Screening Test and the Wechsler Intelligence test to examine physical and neurological levels of children who had recovered from severe EV-71 infection in the CNS, Chang et al. showed that pediatric patients with EV-71 involvement in CNS, which had been complicated with cardiopulmonary failure, had notably diminished cognitive abilities . Although most patients suffered from damage in the cerebellums, brain stems and upper spinal cords, no evident cerebral injury had been detected. Interestingly, some patients were affected with attention deficit hyperactivity disorder (ADHD), of which the diagnosis could only have subtle difference from that of Asperger’s syndrome . Interestingly, methylphenidate, a drug that increases brain levels of dopamine and epinephrine , is effective in modifying unstable behavior patterns in patients with ADHD, Asperger’s syndrome and autism, suggesting that these disorders may share some damage deeply embedded in the brain. EV-71 infection is associated with pediatric liver diseases as well . It is possible that when perinatal infection occurs in the intermediate third trimester, the maternal immune system are able to provide protective antibodies in time to save her fetus. Since the fetus is in amniotic sac, virus infection of brain stem may not readily induce fatal pulmonary edema or consequent cardiopulmonary failure like the older children [5,9,17]. However, residual viruses in the liver and hepatic duct might lead to biliary atresia when a newborn was delivered. At the time of delivery, maternal immune system might not be able to provide protective antibodies in time for newborns, and the infant itself would not have sufficient time to provoke its own immune response, such as in case #4, whereby the child might have been normally delivered, but virus infection could have advanced to a fulminant hepatic failure within a few days of child birth. From timeframes and aftermaths, it is reasonable to speculate that EV-71 may at first be present in fetal livers and then propagated to the CNS. Depending upon the gestation stages, and maternal immune responses, the protective antibodies might be able to eliminate the virus and save the fetus synchronously in the late second trimester, when organs would have been fully formed. However, because fetal immune systems are not matured during the intermediate third trimester, which are similar to those in a newborn child , we are less certain that following exhaustion of protective antibodies from maternal source, the newborn can produce an adequate amount of antibodies to eradicate viruses and to protect itself. A cohort study of patients with ASD, showing increased levels of serum ALT and AST, indicated that ASD patients might suffer from liver complications . Moreover, ASD and cerebellar atrophy were frequently associated with mitochondrial defects [21,22]. Evaluation of neuropsychological symptoms in combination with gastrointestinal and liver functions in these patients would provide a more profound understanding of the etiology of this disease and better interventions in the future . Moreover, based on the above-mentioned symptoms, several young ASD patients were respectively treated with Yi-Chi-Tsung-Ming-Tang- and Jiawei Xiaoyao San-based regimens for their hepatic function-associated constipation and brain symptoms in an ongoing investigation [24-26]. The preliminary results are promising, in particular the constipation problems of ASD children having been quickly resolved. The results supported our previous observations that virus infected both brain and liver in addition to intestines . In conclusions, our results show that depending upon the timing of virus infection during pregnancy, four types of clinical features of EV-71 infection could be detected. However, other explanations are possible. For instance, the patients might have been infected with other neurogenic viruses [27-29], or the patients might have genetic disorders, which made them more vulnerable to the disease [5,21,29], or fetuses might have suffered from infectioninflicted oxygen deficiency, or cytokine storms . Moreover, most expecting mothers had had flu-like symptoms, but no flu-related virus infection was detected. However, intracranial viral infection affected fetal growth and the subsequent childhood development. Therefore, early prevention is imperative for reducing prenatal and pediatric infection. Furthermore, if ASD is in fact closely associated with prenatal virus infection, our data suggest that the future therapy for neural system-related psychological disorders could be anticipated. In this study, we found that some of the pediatric patients with autism spectrum disorders (ASD) had been prenatally infected with enterovirus 71 (EV71), and EV-71 infection prevalence correlated with annual incidence of ASD. Moreover, a result of preliminary regimen using Chinese herbal medicinal recipes shows that this type of patients is treatable. We thank Drs. Chien‐Chung Lee (Bosin Clinic for Obstetrics and Gynecology, Da-Li District, Taichung, Taiwan), Ching-Tien Peng (Department of Pediatrics, China Medical University Hospital, Taichung, Taiwan), Hsien- Yuan Lane (Departments of Psychiatry, China Medical University Hospital, Taichung, Taiwan) and Chin-Su Liu (Department of Pediatric Surgery, Taipei Veterans General Hospital, Taipei, Taiwan) for their professional experiences and invaluable suggestions for this study. This study was supported by the Comprehensive Academic Promotion Projects for National Chung Hsing University (NCHU 1025025, National Chung Hsing University, Taichung, Taiwan and Ministry of Education, Taipei, Taiwan). The authors declare no conflicts of interests in this work. The Medical Ethics Committee of China Medical University Hospital had approved the protocol, and written informed consent was obtained from every patient and guardians of the patient before surgery (DMR101-IRB2-50). YCH, TCC, SHC and KCC found the cases and designed the study. YCH, CSC, TYL, KHW and TCC collected and diagnosed cases as well as performed the experiments. SHC and SHL collected statistical data and did statistical analyses. SHC and KCC coordinated the study and interpreted the data. YCH, TCC, SDW, CSC and KHW treated patients. YCH, TCC, KCC and SHC wrote the manuscript. All authors read and approved the final manuscript. Hayward JC, Gillespie SM, Kaplan KM, et al. Outbreak of poliomyelitis-like paralysis associated with enterovirus 71. Pediatr. Infect. Dis. J 8(9), 611-616 (1989). Alexander JP, Baden L, Pallansch MA, et al. Enterovirus 71 infections and neurologic disease - United States, 1977-1991. J. Infect. Dis 169(4), 905-908 (1994). Wang SM, Liu CC, Tseng HW, et al. Clinical spectrum of enterovirus 71 infection in children in southern Taiwan, with an emphasis on neurological complications. Clin. Infect. Dis 29(1), 184-190 (1999). Shen WC, Chiu HH, Chow KC, et al. MR imaging findings of enteroviral encephalomyelitis: an outbreak in Taiwan. AJNR. Am. J. Neuroradiol 20(10), 1889-1895 (1999). Chumakov M, Voroshilova M, Shindarov L, et al. Enterovirus 71 isolated from cases of epidemic poliomyelitis-like disease in Bulgaria. Arch. Virol 60(3-4), 329-340 (1979). Nagy G, Takátsy S, Kukán E, et al. Virological diagnosis of enterovirus type 71 infections: experiences gained during an epidemic of acute CNS diseases in Hungary in 1978. Arch. Virol 71(3), 17-27 (1982). Lum LC, Wong KT, Lam SK, et al. Fatal enterovirus 71 encephalomyelitis. J. Pediatr 133(6), 795-708 (1998). Chow KC, Lee CC, Lin TY, et al. Congenital enterovirus 71 infection: a case study with virology and immunohistochemistry. Clin. Infect. Dis 31(2), 509-512 (2000). Liu C, Chiu JH, Chin T, et al. Expression of fas ligand on bile ductule epithelium in biliary atresia - a poor prognostic factor. J. Pediatr. Surg 35(11), 1591-1596 (2000). World Health Organization. International classification of diseases (10th ed.) 1994 Geneva: World Health Organization (1994). American Psychiatric Association. Diagnostic and statistical manual of mental disorders (4th Edtn. ): American Psychiatric Association: Washington, DC (1994). Chang LY. Enterovirus 71 in Taiwan. Pediatr. Neonatol 49(4), 103-112 (2008). Schmidt NJ, Lennette EH, Ho HH. An apparently new enterovirus isolated from patients with disease of the central nervous system. J. Infect. Dis 129(3), 304-309 (1974). Joseph RM. Neuropsychological frameworks for understanding autism. Int. Rev. Psychiatry 11(4), 309-324 (1999). Mason-Brothers A, Ritvo ER, Pingree C, et al. The UCLA-University of Utah epidemiologic survey of autism: prenatal, perinatal, and postnatal factors. Pediatrics 86(4), 514-519 (1990). Chang LY, Huang LM, Gau SS, et al. Neurodevelopment and cognition in children after enterovirus 71 infection. N. Engl. J. Med 356(12), 1226-1234 (2007). Mukaddes NM, Hergüner S, Tanidir C. Psychiatric disorders in individuals with high-functioning autism and Asperger's disorder: similarities and differences. World J. Biol. Psychiatry 11(8), 964-971 (2010). Sukhodolsky DG, Scahill L, Gadow KD, et al. Parent-rated anxiety symptoms in children with pervasive developmental disorders: frequency and association with core autism symptoms and cognitive functioning. J. Abnorm. Child. Psychol 36(1), 117-128 (2008). Goldman AS, Ham Pong AJ, Goldblum RM. Host defenses: development and maternal contributions. Adv. Pediatr32(1), 71-100 (1985). Weissman JR, Kelley RI, Bauman ML, et al. Mitochondrial disease in autism spectrum disorder patients: a cohort analysis. PLoSOne 3(11), e3815 (2008). Scaglia F, Wong LJ, Vladutiu GD, et al. Predominant cerebellar volume loss as a neuroradiologic feature of pediatric respiratory chain defects. AJNR. Am. J. Neuroradiol 26(7), 1675-1680 (2005). Samsam M, Ahangari R, Naser SA. Pathophysiology of autism spectrum disorders: revisiting gastrointestinal involvement and immune imbalance. World J. Gastroenterol 20(29), 9942-9951 (2014). Yeh CH, Hsieh MT, Hsueh CM, et al. Therapeutic effect of Yi-Chi-Tsung-Ming-Tang on amyloid β-induced Alzheimer's disease-like phenotype via an increase of acetylcholine and decrease of amyloid β. Evid. Based Comp. Alternat. Med2012(1), 414536 (2012). Yeh CH, Lin SF, Lin CY, et al. Acute onset of parkinsonism with reversible course after H1N1 vaccination: insight from a young lady. J. Neuropsychiatry. Clin. Neurosci24(4), E34-35 (2012). Chien SC, Chang WC, Lin PH, et al. A Chinese herbal medicine, jia-wei-xiao-yao-san, prevents dimethylnitrosamine-induced hepatic fibrosis inrats. Scie. World. J 2014(1), 217525 (2014). Chess S. Follow-up report on autism in congenital rubella. J. Autism. Child. Schi 7(1), 69-81 (1977). Piven J, Simon J, Chase GA, et al. The etiology of autism: pre-, peri- and neonatal factors. J. Am. Acad. Child. Adolesc. Psychiatry 32(), 1256-1263 (1993). Libbey JE, Sweeten TL, McMahon WM, et al. Autistic disorder and viral infections. J. Neurovirol 11(1), 1-10 (2005).